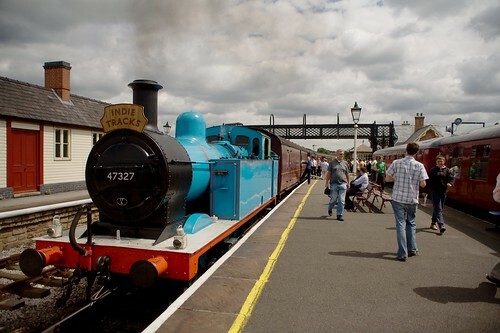 Indietracks - an indiepop festival: Last chance to help our Midland Railway appeal! There's just three days left to help our charity appeal to raise money to finish the Swanwick station building at the Indietracks festival site. The appeal finishes on Friday 10 September. We'd like to say a massive thanks so much to everyone who's contributed so far. The appeal has raised well over £1,300 for the Midland Railway charity. If you haven't had a chance to contribute yet, it would be fantastic if you could help us push the total a bit higher before Friday. We've launched this appeal to help the charity finish their Swanwick station building (pictured here). If you came along to the festival in 2007 you'll have seen the foundations were already laid for the station building (pictured above). Four years later, it's progressing gradually, and the shell of the station is virtually complete. We'd love to help them finish it completely! If you'd like to contribute something, please visit www.charitygiving.co.uk/indietracks2010 by Friday 10 September. Thanks again to everyone who's contributed! !